How can food’s energy content, nutrition, texture, taste etc. be explained in terms of the atomic, molecular and macromolecular structure of the food? Food’s energy content, nutrition, texture, tastes, and more can be explained in terms of the atomic, molecular, and macro-molecular structure by examining the atomic makeup of the elements the foods are made of. Depending on if the atomic makeup is ionic or covalent, the food can turn out much differently. How can we measure the qualities and desirability of a finished recipe both quantitatively and qualitatively in order to determine the success of our recipe experimentation? Definitely how it tastes to testers is a big part of knowing how the experiment went. Other than that, running specialty tests works as well. For our project, we made sauces and ran viscosity tests on them. A viscosity test tests the solidity of the sauce and how far it spreads when poured onto a flat surface. For the burger sauce, the sauce with vinegar(Sauce A) spread out more during the viscosity test. Also, Sauce A tasted worse than Sauce B, which had no vinegar at all. In what way(s) is cooking like doing science and in what way(s) are they different? How are a cook and a food scientist similar or different? There are more similarities between the two than there are differences. Cooking is the process of changing foods and combining them to make better foods. Science, chemistry I’m assuming this is talking about, is about mixing different atoms and trying to make new elements or trying to understand the makeup of the universe. However, cooking is only for making food while doing science can be for anything, such as making poisons or bombs. A cook and a food scientist are the same in the fact that they both work with food. They are different in the way that one only works with food, while the other tries to understand how everything is made up and why certain things react the way they do with each other. * For the questions below please use all of the sources referenced on your infographic. If you reference less than three sources then please include other sources you consulted but did not cite. If you reference more than eight sources on your infographic, please select the eight most significant. Sources can include anywhere you gathered information, data, charts or images from. For this project you consulted a variety of sources of varying degrees of credibility and bias. Although all of the sources you are using and citing should be reliable (otherwise why are you using them?!?) not all sources should be considered equal. 1) Rank the sources you cited on your infographic from “Most Reliable and Least Biased” to “Least Reliable and Most Biased”. Provide an explanation for your ranking scheme. The sources I used to make my infographic were all decently ‘reliable’, but as always, some were better than others. I’m a little confused on what least biased and most biased mean, but I understand ranking them from most reliable to least reliable. Most Reliable: BU-210b: How does the flow battery work? I believe that this was the most reliable website I visited and cited because it is from an online resource based solely around batteries and information of batteries for all ages and professions. It also helped me understand how flow batteries work. Even if it isn’t the most reliable, it is still pretty good. This is the one that helped me the most to develop my infographic. It’s the one I consulted the most to understand what flow batteries do and why they’re good. This is the first website I looked at and also the website that started my interest in flow batteries. I was originally going to just learn about the dye, but flow batteries in general seemed more interesting and had more information about them. For this project you also likely referenced both primary (aka ‘original’) and secondary sources. In the field of science primary sources are most commonly scientific journal articles published in peer-reviewed scientific journals or data sets published by educational or governmental sources. Secondary sources include Wikipedia, newspaper articles, magazine articles, blogs and educational websites all of which should reference the primary source(s) they gathered their information from. Tertiary sources would be sources that reference secondary sources. As a rule tertiary sources should be avoided and secondary sources should be scrutinized by going back to the primary source(s) whenever possible unless the secondary source has a longstanding reputation for quality like a major national periodical (Wall Street Journal, New York Times, National Geographic, Scientific American etc.). 2) Classify all of the sources cited on your infographic as primary, secondary or tertiary. Explain the rationale for your classification for each source. How does the Flow Battery Work and Redox Flow Batteries are both primary sources while Glow-in-the-dark dye could fuel liquid batteries is a secondary. The first two articles are factual and do not reference any other articles. They are just for explaining. The third article is definitely that, an article. It was written by an author as a news story so it does reference other sources. Reading primary sources can be very challenging because of the technical and specific nature of the content and because they are often only available through subscription services or purchase. However, it is usually possible to access the Abstract of primary sources for free and the Abstract is also usually the most easily understood section of a scientific paper. 3) Read over the Abstract from one of the primary sources you used. If you did not consult a primary source for your infographic, find one that is related to your topic and use it for this question. I found another article with an abstract because I wasn’t able to find the abstract on my other sources. a. Who are the authors of this paper, what journal is it published in and when was it published? Hiroko Kaneko, Ken Nozaki, Yutaka Wada, Takamichi Aoki, Akira Negishi, and Masayuki Kamimoto are the authors. It was published on ScienceDirect.com from the journal Electrochemica Acta and was published in 1991.
b. Summarize the key points from the abstract. Different vanadium ions were being investigated to see which ones can create a better reaction for the flow battery. c. Based on this abstract, what do you think the purpose of an abstract is and what information do you expect to find in the abstract of a scientific journal article? I expect to find the main points simplified in an abstract. That is what they are mainly for; explaining the whole article in summary form for others to read quickly. Please respond to the first two questions and either the third or fourth question depending on which is more appropriate for your project. The length of each response should be at least one paragraph. Each response should use evidence to support claims and should answer the question clearly and completely. Reflections will be evaluated on depth of thought and refinement. Explain your understanding of the relationship between combusting fossil fuels, the greenhouse effect and climate change in a manner that would be appropriate for teaching a middle school student. My understanding of the relationship between combusting fossil fuels, the greenhouse effect, and climate change is that when fossil fuels are combusted, when they are used for power, they release gases into the atmosphere that get trapped. Most gases used to just pass through the ozone layer into space, but there are so many more gases being released that the atmosphere can’t get rid of them fast enough. The gases then bounce back down to the surface and start heating up the atmosphere closest to Earth. This is turn can melt glaciers and change the overall temperature of the planet’s crust. What is the role of scientists and engineers in society? In what ways is life as we know it better (or worse) because of their work either in basic scientific research or the development of implementable technologies? The role of scientists and engineers in today's society is to try and understand the universe and help humankind to grow. We have many new inventions that help us and we know so much about what’s outside of our planet, however, we know the dangers of what we do. For example, we all thought that gas and oil were great, but then we found out what they do to the atmosphere. How significant is the climate change related problem you identified? What are its root causes? What, if anything, can be done to mitigate the severity of the problem or are the outcomes inevitable? I’m not sure what you mean by the problem I identified, but a huge problem is the melting of the polar caps and glaciers around the world. Once they have melted, the sea levels will have risen pushing millions of humans farther inland. We’ll run out of a lot of space. What can be done to help prevent this is to use more renewable energies such as solar energy and wind energy in conjunction with flow batteries or any number of rechargeable batteries. "Glow-in-the-dark Dye Could Fuel Liquid Batteries." Glow-in-the-dark Dye Could Fuel Liquid Batteries - ASM International. ASM International, 22 Nov. 2016. Web. 07 Dec. 2016. "Redox Flow Batteries." Energy Storage Association. Energy Storage Association, n.d. Web. 07 Dec. 2016. 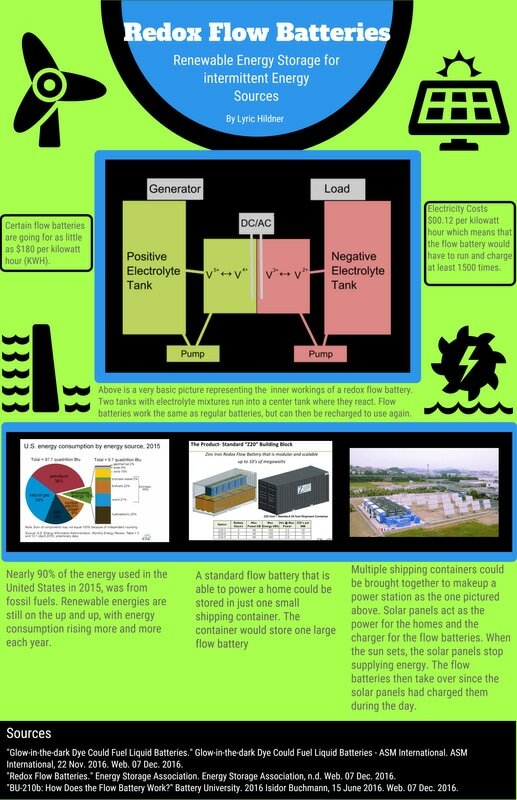 "BU-210b: How Does the Flow Battery Work?" Battery University. 2016 Isidor Buchmann, 15 June 2016. Web. 07 Dec. 2016.